What can I do with the light layer? With the light layer you can lighten your scene. 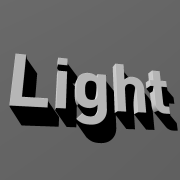 How do I create a light layer? Choose LAYER > Add layer > Add light layer... to create a new light layer. The new light layer can be selected from the layers dropdown to make it the active layer. The installer comes with shows demonstrating the possibilities of the light layer. Choose FILE > Open show... and select a show from the BluffTitler/Media/Shows/Light folder. With the first layer style dropdown you can set the light type. With the shadow properties you can make layers cast shadows over themselves and other layers. You can prevent a layer to generate shadows by marking the Never generate shadows checkbox in the LAYER > Active layer properties... dialog. You can make the light itself visible by loading a flare texture by pressing the Change texture... button. By default the light is behind the camera so you might have to move it to make it visible. 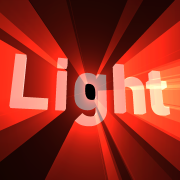 This example uses the flare16.jpg texture and the Flare effect. 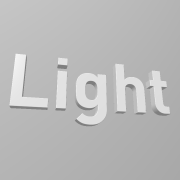 With the Beam length property you can add lightbeams to text, EPS, picture, model and sketch layers. 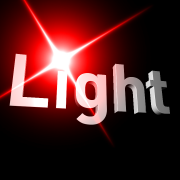 Note that you have to position the light at the other side of the text to create this effect. You can prevent a layer to generate lightbeams by marking the Never generate lightbeams checkbox in the LAYER > Active layer properties... dialog. The current version has 1 limitation: transparent pictures can't generate lightbeams. You can create up to 4 point lights. 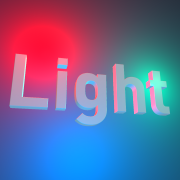 This example uses a red, green and blue light. 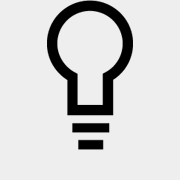 Point lights have a position and cast light in all directions, like a light bulb. Click on the Change texture... button to load a flare texture. The default light position is behind the camera, so you might have to move the light to make it visible. The light is always visible, even when it is behind another layer. This is the realistic situation. This unrealistic option can be used for special effects. The light is never visible. Shadows are turned on with the Shadow intensity property. The 3rd dropdown sets the shadow algorithm. Projected shadows (also known as fast or fake shadows), are super fast, can handle transparent textures, can handle morphing effects, but only render shadows on the floor. Set the vertical position of this floor with the Shadow plane position property. When using a mirror layer, make sure the position of the mirror layer matches the Shadow plane position property and use the Not clipped style. When using a picture layer as the floor, use the 3D in background style. This projects the shadows on the wall. Set the depth position of this wall with the Shadow plane position property. Shadow volumes (also known as stencil shadows) can render shadows on all surfaces of other layers, but are slower, can't handle transparent textures and can't handle morphing effects. In contrast to fast shadows, shadow volumes need other layers to receive the shadow. And the layer that receives the shadow must write to the depth buffer. For example, picture layers must use the 3D in 3D space style to receive shadows. Particle and scroller layers do not cast shadows. Shadows are rendered incorrectly if the camera stands in the shadow. The light position of the point light. By putting the light close to the surface you can simulate a spotlight. The diffuse colour of the light. Note that the colour an object appears to have is the result of the combination of the light colour and the material colour. For example if you light a yellow object(255,255,0) with a purple light(255,0,255) it appears red(255,0,0) because that's the colour component they have in common. The light intensity. Be careful with high intensities. The length of the lightbeams that are created by the silhouettes of the Text and EPS layers. Notice that the length of the lightbeam also depends on the distance to the light source. The minimum distance to the light necessary to generate a lightbeam. The darkness of the shadows the light creates. A value of 0 means no shadows, 0.5 means the shadows are half transparent and a value of 1 creates opaque shadows. This property is only used when using Fast shadows. It sets the position of the plane the shadows fall on. The size of the flare. Click on the Change texture... button to load a flare texture. The colour of the flare.